Charlie Cook of The Cook Political Report gave a “just in time” overview of the upcoming midterms—just days before the elections. His Nov. 2 remarks, which offered analysis of the latest polling information and key congressional and gubernatorial races ahead of Tuesday’s midterm elections, aired live on C-SPAN. The network is re-airing the broadcast of Cook’s remarks over the weekend, including at 6:40 p.m. ET on Nov. 2; check your local programming schedule for broadcast times in your area. In a professionalism plenary, contestants matched wits in a thrilling game-show competition. Ultimately Laura Hanson won the title of “Chief Actuary,” but all participants in the interactive session enjoyed themselves. 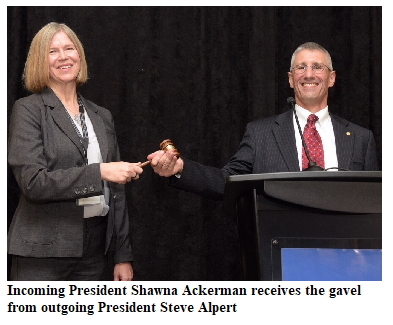 We’ve posted some photographs from the meeting for members—look for complete coverage of this marquee event in the November Actuarial Update later this month. The Academy presented its annual service awards at this meeting. Geoffrey Sandler received the Jarvis Farley Service Award for making significant contributions during his long and distinguished record of Academy volunteerism, including stints as vice president of both health and professionalism. Elise Liebers received the Robert J. Myers Public Service Award in recognition of her work in developing an NAIC risk-based capital formula, building insurance expertise within the Federal Reserve Bank of New York, and being a leading U.S. voice at the International Association of Insurance Supervisors on financial stability and international standards for insurance supervision. The Academy gave its annual Outstanding Volunteerism Awards to Karen Bender, Lauren Cavanaugh, Jason Russell, and Wayne Stuenkel. The Academy livestreamed the awards ceremonies; members who were unable to attend can watch a replay of the presentations on our Facebook page. 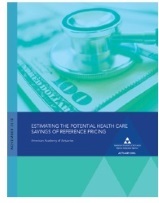 The Health Practice Council released a monograph, Estimating the Potential Health Care Savings of Reference Pricing, based on the Academy’s new research on this topic, at the Annual Meeting. It examines the potential savings in health care spending from an expansion of reference pricing to a broader range of outpatient and inpatient services, along with factors that could hinder savings. Steve Jackson, the Academy’s assistant director for research (public policy), was the primary drafter for the monograph, and he led a spirited breakout session at which the new research was released. Members who were unable to attend the Annual Meeting can watch a replay of the session—the Academy livestreamed the session on our Facebook page. Life Perspectives, a new quarterly Academy publication, is designed to keep you up to date on activities of the Life Practice Council. 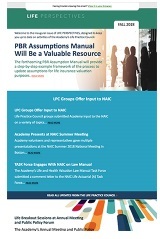 In the inaugural issue, read about the Academy’s forthcoming Principle-Based Reserving Assumptions Manual, which aims to provide a step-by-step example framework of the process to update assumptions for life insurance valuation purposes—along with all the other activities of the LPC from the past several months. Life Perspectives is sent to life actuaries, but if you didn’t get a copy and would like to, please send an email to editor@actuary.org and we’ll add you to the distribution list. In the October issue of Actuarial Update, Academy members are urged to vote on significant bylaws amendments—voting runs through Friday, Nov. 9. You should have received an email from our election vendor, Intelliscan, with a personal one-time only use linking to the ballot. The two proposed amendments are explained in detail here. Check your junk filters if you haven’t received it. Voting closes at 11:59 p.m. ET on Nov. 9, 2018. If you did not receive the email, please let Claire Mickelson (mickelson@actuary.org) know and we will request it be resent to your member profile email address. 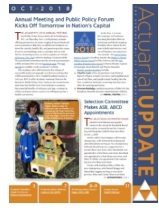 Also in this issue, the October professionalism webinar looks at the anatomy of the ASOPs; the Capitol Forum webinar covered the Congressional Budget Office’s Health Insurance Simulation Model; and the “Professionalism Counts” column recaps—and celebrates—some of the Actuarial Standards Board’s many accomplishments 30 years after it was formed. 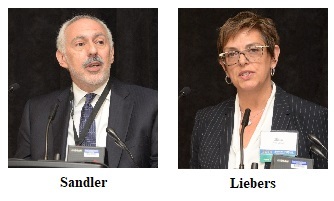 Several Academy members are among a just-announced expert panel appointed by the Social Security Advisory Board (SSAB) to review assumptions and methods used to develop the annual report of the Social Security Trustees. Past Academy President Bob Beuerlein (2016–17) will chair the SSAB. Past Academy President Tom Terry (2013–14) and Ron Gebhardtsbauer, a former Academy senior pension fellow, are new members. The SSAB reviews the financial status of the Old-Age, Survivors, and Disability Insurance trust funds. The 2019 Technical Panel on Assumptions and Methods is the sixth quadrennial panel the board has commissioned since 1999. More information about the SSAB can be found on its public webpage. With the midterm elections just days away, a reminder that the Academy’s series of 2018 Election Guides on major issues of national interest can help voters become better informed heading into the voting booth. The issue-focused guides offer voters information on select campaign topics of which actuaries have expertise, including health care and health insurance; Medicare/Medicaid; long-term care; Social Security; lifetime income and retirement risk; and climate risk. The Long-Term Care Past Losses Considerations Work Group released an issue brief, Long-Term Care Insurance: Considerations for Treatment of Past Losses in Rate Increase Requests, to identify issues commonly raised in favor of and against recoupment of past losses in various situations. The Solvency Committee submitted comments to the International Association of Insurance Supervisors (IAIS) on the Risk-Based Global Insurance Capital Standard Version 2.0 (ICS 2.0) public consultation document dated July 31, 2018. The Centers for Medicare & Medicaid Services (CMS) Center for Consumer Information & Insurance Oversight (CCIIO) released public use data on health insurance exchanges and rates for 2019. The data includes health insurance exchange public use files and rate review data. Life and Health Qualifications Seminar—Nov. 4–8, Arlington, Va.
A pet column in TulsaWorld cited statistics from “A Policy for Fluffy,” a feature about pet insurance from the September/October issue of Contingencies.